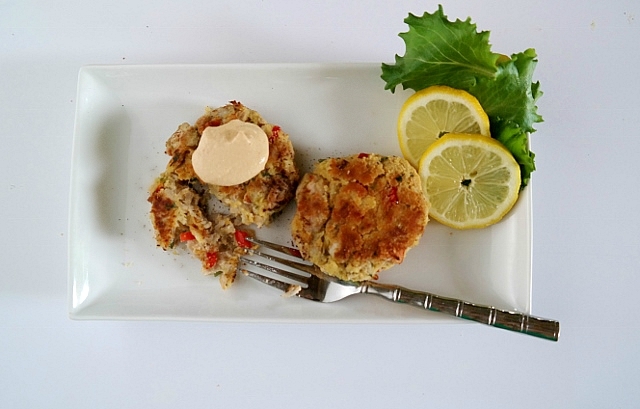 Jackfruit Crab Cakes: You Gotta Try These! 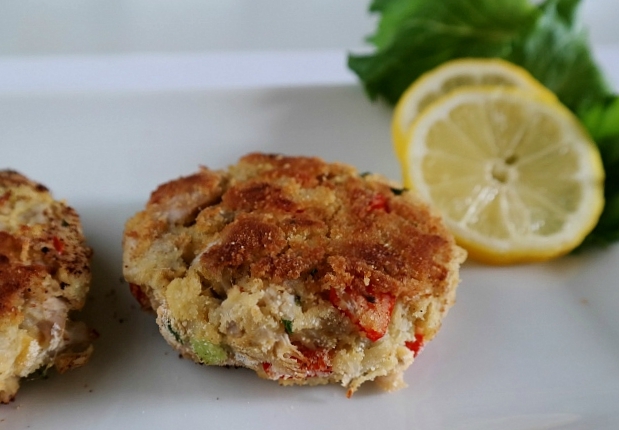 Jackfruit Crab Cakes, You Gotta Try These! For the last three years, I’ve been sharing recipes with you that use young green jackfruit. 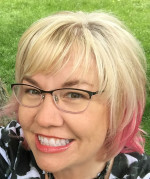 I’ve shared BBQ “pulled pork” style jackfruit in both KC and Carolina styles, tamale bites, Korean BBQ tacos, tacos with wild rice, Reuben Sandwiches, Reuben dip, a plethera of dishes made with the world’s largest tree-borne fruit. I often shred jackfruit, as it looks like and takes on the texture of shredded pork when it has been simmered in sauce. For the crab cakes, I wanted a slightly more flaky texture and succeeded. I can’t wait to share how I did this. It’s so easy! The jackfruit used in this recipe and many of my other original recipes is young green jackfruit. This is available canned at your local Asian market. You can also buy it on-line, but I find it cost prohibitive. 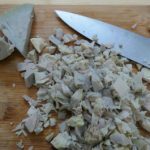 You should look for jackfruit packed in water, not in brine. You also want to be certain it is young green jackfruit. Ripe jackfruit is quite sweet and most frequently used in desserts. The flavor of Juicy Fruit gum is based on the flavor of ripe jackfruit. Jackfruit is also available fresh (almost always ripe) as well as frozen in Asian markets. The frozen variety will also work in my recipes. Be certain to drain it very well first, as it is usually packed in water and then frozen. Steam or boil the cauliflower florets until they are tender. Drain and allow to cool. Drain and rinse jackfruit. Place in a small saucepan, cover with water. Over medium heat, bring to a boil. Cook for 10 minutes at a slow boil, until jackfruit is fork tender. Drain and allow to cool. 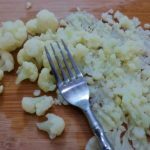 While jackfruit is cooling, using a fork gently mash the cauliflower florets. You don't want this to be a smooth puree, leaving a few pieces about the size of a pea or so. Next chop the jackfruit until it is flaky with just a few bite sized chunks left intact. In a large mixing bowl, combine all ingredients except coconut flour. Stir to combine. In a large skillet, heat the 2 Tablespoons of oil over medium heat. While pan is heating, make the mixture into cakes/patties. Using a large scoop (I use a #12 scoop which is roughly 1/3 of a cup), scoop out the mixture into your hands, press into a patty about 3" in diameter. 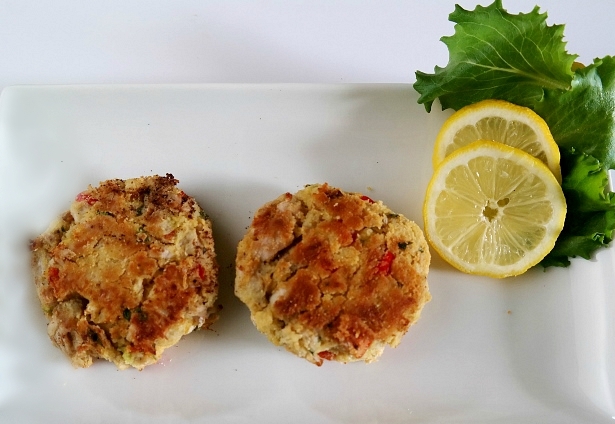 You will make 6 crabby patties/crab cakes. 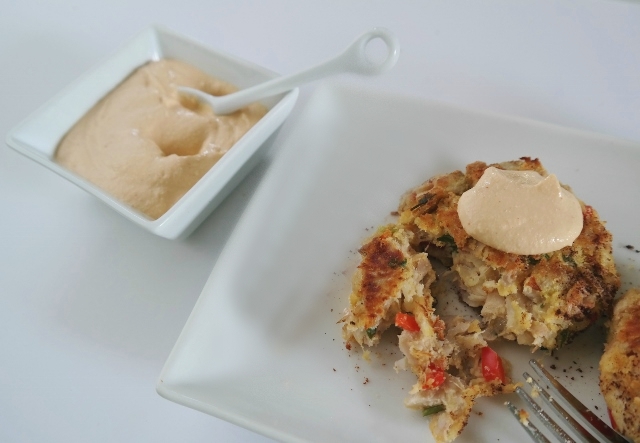 Place the jackfruit crab cakes into the skillet. Over medium heat, cook about 3 minutes on each side until they are nicely browned. Remove to the parchment lined baking sheet. Bake for 10 minutes at 375 degrees. Serve with a slice of lemon and Sriracha Cashew Cream. 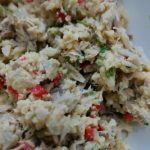 Modifications included removing the crab, removing eggs, adding ingredients, editing cooking methods after repeated testing. Thank you to those who continue to inspire and amaze me! Disclosure: This post contains affiliate links. Should you make a purchase of a product I have recommended, you will still get the same great price. I may make a small commission, which I use to offset the cost of maintaining this website and bringing original content to you for no charge. I appreciate your support! Thanks so much, Shirley! I was researching my ingredients today (food nerd reporting for duty…) and found that Old Bay seasoning is from your part of the country. I wasn’t sure which “old bay” it referred to; now I know. I hope you will try it. Thanks for dropping by! Is the cauliflower acting as a binder? Is there a substitute. Can’t wait to try! Hi there! Thanks for your comment. The cauliflower is a bit of a binder. I have not tried it with any substitutes, however I wonder if lightly mashed potatoes would work. Please report back and let us know what works! Do you put the sriracha sauce (or mayo) in the recipe in addition to it being for dipping? Hi Liz! Thanks for your questions. I have not tried baking them. If you do, please let me know how they come out. I do not cut the core off of the jackfruit segments. I have seen some do that, however I don’t find the texture or the flavor offputting and see no reason to waste it as it is completely edible. I made this for someone who has PKU with just two changes and he loved them. I didn’t have vegan mayo or coconut flour, so I swapped for real mayo and wheat starch. Thank you so much for posting. I am also looking to make these for someone who has PKU. Did they turn out crumbly with the wheat starch? I can only find the jackfruit in brine around me. Will this work? I would omit any added salt. Trying to avoid having to order this item. Thanks in advance! It will certainly work. I just rinse, rinse, rinse mine to eliminate as much salt as possible as the brine does have a very salty tang to it. These are delicious!! I used almond flour instead of coconut flour because it’s what I had on hand. The result was that they didn’t hold together well. I will stick with coconut flour next time. I also doubled the Old Bay because it’s my favorite and added two strips of chopped nori. Thank you for such a great recipe. I think it’s my favorite jackfruit recipe yet!! Thanks for sharing your experience with almond flour. I bet the nori added a bit of the “flavor of the sea” to these. What a great idea!